Bestselling author Amy Parker inspires children to dream about their future and trust that God has great plans for their life. 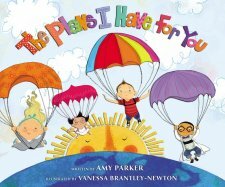 The Plans I Have for You combines playful rhyming text written by bestselling children's book author Amy Parker with whimsical illustrations by award-winning artist Vanessa Brantley-Newton to create a book that inspires readers of all ages to dream about their future. God has great plans for each and every one of us and this book encourages children to think about the talents that make them special and will help them imagine how God may use our unique traits to make the world a better place. This is such a beautiful fun book for kids! I love that it teaches children to dream about their future and to trust that God has a plan for them. I also love the playful rhyming and beautiful illustrations throughout the book. This book encourages children to think about the talents they have that make them special and the uses they may have for these talents in the future. I enjoy reading this book with my children and encouraging them to dream and plan their future. You can find The Plans I Have For You by Amy Parker on Amazon, Barnes and Noble and at other bookstores.